We had this dish for the wonderful “Breakfast at the Hacienda” I featured yesterday, and it was a really pleasant surprise. This salad was a perfect match with the fried eel or “sili”, and most of us at the table wondered aloud how it was made. So the family cook of many decades, was summoned to the table, and he quickly described how the dish was made. No proportions were given, but I thought it sounded doable. Back home in Manila, I was anxious to see if I could replicate this dish and sent someone to the market to buy some banana hearts. We dropped the banana hearts into boiling water and let it cook for some 12+ minutes until it seemed tender enough and drained it and let it cool to room temperature. Next, cut the cooked banana hearts into half inch slices.. I mixed up what struck me as being a “provincial” tartar sauce made of mayonnaise, finely sliced onions, some sweet pickle relish, coconut cream, salt and pepper and some light brown sugar. I added that to the cooled sliced banana hearts and adjust the dressing to coat the banana hearts well. Throw this into the fridge for at least 2-3 hours to chill it and serve with fried or grilled foods. It sounds like a very 1960’s Betty Crocker experiment… but try it for yourself, it is really quite delicious! Who would have thought that COCONUT CREAM would fit into this dish? Reading it sounded odd. Coconut cream?? Really?? I hope it turns out well with canned banana hearts as well, since fresh ones are quite difficult to find in Europe. Nice idea MM, will try this asap! Great idea, MM! I’d love to try this at home. Sounds like coconut cream and mayo are matched made in heaven – compliment each other! No excuse not to beat the sweltering hot summer with this cool tropical salad. At the back of my head I remember there is a banana heart dish they make somewhere in the Quezon Province where they grilled the banana heart and dressed it up in vinegar coconut milk. They grilled to char coconut shavings and add vinegar to the shaved coconut before extracting the milk. It is very good. I believe the name of the dish is kulayo or kuwago something that begins with K. The name of the dish escaped me at this moment. We always make this with coconut cream. No mayo. You can use banana hearts instead of artichokes in dip with or without spinach. Hmmm! like ginataang banana hearts that’s served cold and not hot, sounds yummy! Yum! 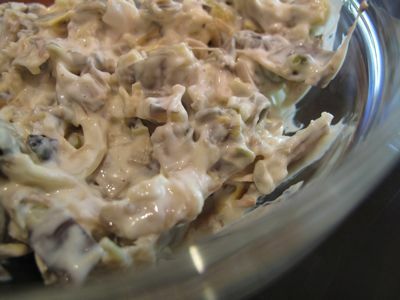 I am thinking langka instead of banana hearts in your salad….also a good sub for artichokes (hot artichoke dip) if artichokes in Pinas is not cost effective. For those in North America where fresh young langka and banana heart aren’t accessible, fresh artichoke hearts will be a good sub for this salad. Just like Maria Clara’s comment up above, grilling the fresh artichoke hearts ( parboil it first in acidulated water, then season with a splash of olive oil before grilling) will taste awesome! Artichokes…perennial but need a looooot of room if you want to grow them. Hey Sister..are you OK? …missed your comments! Maria Clara: The dish you are thinking of is named “kulawo”. It was mentioned in the Besa/Dorotan book when Amy Besa talked about “banana hearts in burnt coconut cream” in a visit to potter Ugo Bigyan’s place in Tiaong, Quezon. Anton (of awesomeplanet) also has a picture on an old post of his when he visited Ugo Bigyan. Hi, Marketman, this is a wonderful site – got hooked on it last year and check it everyday since I discovered it. I never thought one could make salad of banana hear and I’d like to give this a try – may I know which kind of banana heart to use? Thank you! I just tried a banana heart kilawin last sunday on my younger son Birthday and it was a hit among my guest. They wonder how I was able to make the banana heart yummy as according to them the banana heart that they buy here in singapore tends to be bitter. Well I told them to mash it with rock salt, of course I learn this from MarketMan blog and told them to start reading MarketMan as they will always learn something new everyday. The recipe above is another way for me to try the banana heart blossom. Oh BTW the small banana blossom that you are supposed to take away on a few outer layer saved them on put it on a bangus belly sinigang it is also very good. I also found an ubad here in an indian store. My first try is not a success as the slices ubad has a lot of fiber which I am supposed to take out before slicing it. Will give it a try after lee commented on how to clean it. did you use red or white banana heart? i usually pick the white variety. Ley: is there a space after the nc…I was just wondering bakit bumalik? It looked like there was a space and then the next letter. hi kakusina, I did use a red one for my kilawin. Not sure which type MM use for his chilled salad. sounds like an interesting recipe. thanks MM! hi MM — did you get to taste the salad they make with young langka (jackfruit)? i recall it being delicious and i have been wondering what goes into it apart from vinegar and coconut cream. When I lived in Dumaguete during my elementary years, there was a woman who lived behind our house and she would make this type of salad to sell at the local market. No mayonaise though, she only put coconut cream, vinegar and salt and pepper. I distinctly remember the smell of the banana hearts soaking in the coconut cream and vinegar in a very large vat. It’s the perfect salad to accompany fried fish or other oily, fried food. try also mixing in pineapple chunks! i brought some of this salad to the office one time and my office mates loved it! i gave them my mom’s recipe, of course. my mom adds kakang gata before chilling the salad. betty q, my email add is nctvillanueva@yahoo.com. If you have a problem sending to that add, you may use vta.law@gmail.com. Salamat!!! Hi Betty! Just wondering if you ever posted the recipe for your award-winning chocolate cake? My hubby and I are craving really good chocolate cake. Would appreciate it if you could post. Thanks for asking, I am still out here, I read marketmanila religiously but hurriedly these days due to being busy organizing a DIY wedding in NYC for my daughter.Have been baking 15 dz. individual 4″ round fruitcakes, with candied apricots and orange peel and cardamon flavoured, covered in marzipan and fondant, bordered in lace and topped with a sugar flower. I want them all boxed before the end of April. We may not serve the wedding cake, which I’m making as well, so this will be a token for the guests to take home. betty q, Here’s the recipe for Apricot, Orange and pistachio fruitcake, Sorry, marketman, I know this is off topic. 1 lb butter, 1 lb. brown sugar, 1/2 lb white sugar(1 c. plus 2 tbsp. )8 large eggs, 1 1/4 lb all pupose flour (4c.) 2 tbsp. ground cardamom, 1 tbsp. ground nutmeg, 1 tsp. baking powder and salt, 1 tbsp. orange flavouring or 3 tbsp. orange zest. 2 lb. dried apricots diced, 1 lb. shelled pistachios or walnuts chopped, 1 lb. candied orange peel diced, 1/2 c. rum or triple sec. Combine fruits and nuts with liquor and macerate overnight. Stir occasionally. Beat butter and sugar together 5 min. Add eggs one by one, beat well. Add spices, flavourings and zests, flour, baking powder and salt. Blend well. Fold in macerated fruit and nut mixture. Fill parchment lined pans 3/4 full and bake in preheated 300 F oven. Place a pan of hot water on the floor of the oven. Baking times will vary according to size of pan. Cool. Bring to a boil 1 c. white sugar and 1 c. water to form a sirup. Cool, add 1/2 c. rum or triple sec and pour over cakes. You can poke some holes with a skewer if you like. Let stand 2 days before serving, will keep well refrigerated for 1 month. Glaze with apricot jam. we make the banana flower slald only with kakang gata…delicious!! think FIBER!! Happy to know you are OK, Sister!!! Oh, I just looooove cardamom, Sister! Maraming Salamat….have to go buy ingredients! Oh, I would have loved too like Natie to give you a hand!!!! Ay, yay, yay!!!! 15 dozens?!?!!! Jun B and Quillene: Sali ako sa experiment ninyo. I just made it now using asparagus (in season here. In fact, I have a 25 ft. row of aspapragus in the community garden). First, I cooked the asparagus like ADOBO!!!. Then let it cool and added a dressing made with low fat sour cream, salt/pepper to taste, some mashed roasted garlic, coconut CREAM, and splenda to taste. OHHHHH, it is soooooo good! First tasted this at Ugu Bigyan’s almost a year ago. His version is hot, not salad cold, and no mayonnaise. This is one of the dishes that I crave again and again and again. I imagine I can eat it with my other craved dish which is crispy fried baby galunggong. Hi everyone, I used the red banana heart, and I specifically didn’t give measurements as this is not my recipe, and the promised the cook I wouldn’t give it away totally. So you are going to have to eyeball the ingredients. I suggest you start with the mayo and coconut cream then add the onions, pickles, etc and keep tasting it until you are happy. Then mix with the blanched and chopped banana hearts. This I will do and try very soon, because we make this salad with just coco-cream and vinegar. With the added mayo it looks tastier. Naku MM, nakakagutom na talaga itong mga huling post mo. Bacolod food is simply scrumptious. Ms. betty q., this award-winning chocolate recipe of yours is very intriguing. If it’s okay with you, you know where to email the recipe. In the meantime, pag gawa ko ng violet biko, ikakain ka naming tunay. :P Ay, for the first time, my son made pancakes na siya lang lahat ang gumawa from start to finish. Masarap magluto! Sister, parang ang sarap sarap ng recipe mo. Maybe next time I can try it too. Thanks very much for sharing. Ms. DADD-F: Hindi parang masarap ang fruitcake ni Sister….TALAGANG MAAAAASARRRRAP!!! It is soooo good with CHAI tea! I cut the fruitcake into thin slices kuno! then it disappeared really fast. Hey, kung wala kang makuha na dried apricot, maybe use dried mango and rambutan? or langka and rambutan…truly making it a Pinoy fruitcake. I am sure you will come up with your own variation. The only thing I added to Sister’s fruitcake is crushed pineapple since I have some leftover and didn’t want to waste it.